Video showing armed police enforcing a lockdown and press conference with Dr. Gene Deisinger, Virginia Tech Deputy Chief of Police. A gunman killed a police officer in a Virginia Tech parking lot Thursday and was found dead nearby in an attack near the scene where a separate mass murder attack began almost five years ago — the scene of the deadliest shooting rampage in modern U.S. history. The gunman, whose identity is yet to be released, killed a Virginia Tech police officer Thursday at the Coliseum campus parking lot and then apparently shot himself to death in the I parking lot (The Cage) about one-half mile west of the murder. 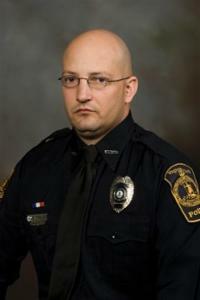 Virginia Tech police officer Deriek Crouse was shot and killed about 12:30 p.m. ET Thursday, Dec. 8, 2011, during a routine traffic stop on the school’s Blacksburg, Va. campus. The gunman was apparently not involved in the traffic stop. Crouse, a 39-year-old Army veteran and married father of five, joined the Virginia Tech campus police department about six months after the 2007 massacre, when on April 16, 2007, Seung-Hui Cho, a senior English major at the school, killed 32 students and faculty before killing himself. The first report in 2007 was a 911 call from West Ambler Johnston Hall about 7:15 a.m. ET Monday, April 16, 2007 where at least two people were shot and killed. The incident on December 8, 2011 also began near West Ambler Johnston Hall in the Coliseum parking lot across the street.